At London Health Sciences, Victoria Hospital, on Friday, January 13th, 2017, in his 94th year. Ivor was the much loved husband of the late Dulcie (née Williamson) (2014). Dear father of Garry (Heidi) and Judie (Gerry) Wheaton. Proud Grandpa of Jill Kazakoff (Jason), Beth Wheaton (Geoff Milsom), Megan (Mark Letellier) and Darcy Williams (Mike Pearson). Great grandfather of Madeline and Allison Kazakoff, of Edson, AB; Sydney and Michaela Dulcie Milsom, of Edmonton; and Ben Williams, of London. Fondly remembered by his niece Myra Henry (Bill), of Goderich, as well as by other members of his extended family. Predeceased by sister Eluned McNair (2014) and brother Maldwyn (WWII). 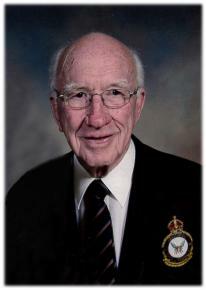 Ivor was a pilot in the RCAF and joined 443 Squadron in December 1942 in Gander. He remained with 443 and participated in the air support for the Normandy Landing in June 1944. Post-war, he became a journalist, eventually taking the position of managing editor of the London Free Press. Later in his career, he was editor of the Regina Leader Post for about 15 years. Active at Westmount Presbyterian Church, Ivor also took part in professional organizations and volunteered in his community. He enjoyed his time with a wide circle of friends. Many thanks to the caregivers at Inspirit and Highview Residences in London, where Ivor spent his last 5 years, as well as to the Ortho and Palliative Care staff at Victoria Hospital. Thanks also to Ivor’s friends who faithfully visited him, took him for coffee and drives and shared memories with him. Cremation has taken place, and a private family celebration of Ivor’s life was conducted at Westmount Presbyterian Church.